Finally one of the biggest liberal anti-never Trumper media outlet has admits that the US economy is now experiencing a economic growth not seen since 1984! The last time the US economy grew at this rate was under President Ronald Reagan another champion of the American working class. Trump has surppased the economic growth of 4 Presidents (Bush Sr, Clinton Bush Jr and Obama). Yes, Trump's rich friends and family are getting richer. Everyone else is worse off now. Awesome. Team Putin is the best! Obama reduced the unemployment rate of 10% during the Bush presidency to 4.5% when Trump took over. Thanks, Obama! 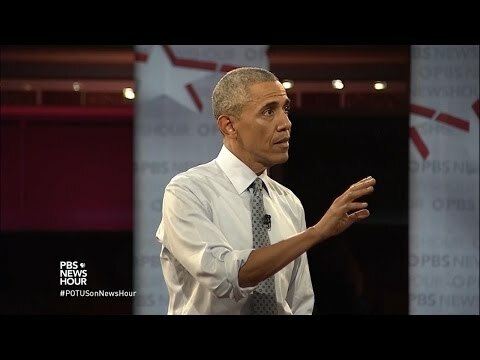 Here is Obama telling people 3 months before leaving the Whitehouse that jobs are not coming under Trump. Lets compare the first 2 years of obama and Trump. Obama lost 8,000,000 jobs between 2008 and 2009. Trump added 4 million jobs in two years from 2017-2018. 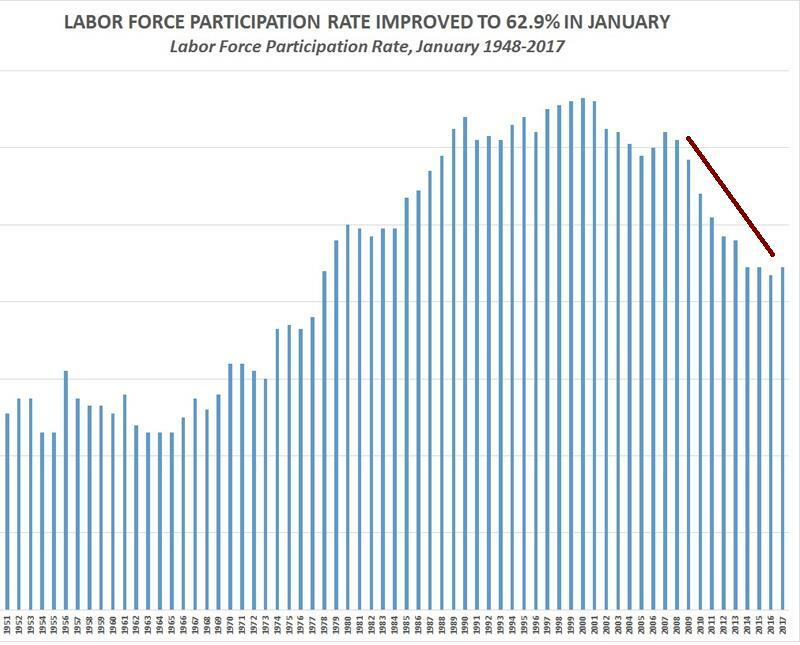 Jobs were being lost under obama and as the chart below shows labour participation under obamas 8 year rule was down and start ticking up when Trump took over. Here is a compilation of Democrats and so called economic guru predicting Trump will destroy the US economy. Here are some of the greatest hits, gleefully compiled from the media over the past 18 months or so. "If Trump wins we should expect a big markdown in expected future earnings for a wide range of stocks — and a likely crash in the broader market (if Trump becomes president)." Eric Zitzewitz, former chief economist at the IMF, November 2016. "Under Trump, I would expect a protracted recession to begin within 18 months. The damage would be felt far beyond the United States." Former Clinton and Obama chief economist Larry Summers, June 2016. "Trump would likely cause the stock market to crash and plunge the world into recession." Simon Johnson, MIT economics professor, in The New York Times, November 2016. "Citigroup: A Trump Victory in November Could Cause a Global Recession", Bloomberg Financial News headline, August 2016. "I have never seen an election in which the markets have so strong of a view as to what was good and bad about the outcome. And what you saw was the markets rallying yesterday because of the FBI thing on Sunday. And the reason I mention this particularly is if the likely event happens and Trump wins you will see a market crash of historic proportions, I think…The markets are terrified of him." Steve Rattner, MSNBC economics guru and former Obama Car Czar, October, 2016. "Wall Street is set up for a major crash if Donald Trump shocks the world on Election Day and wins the White House. New research out on Friday suggests that financial markets strongly prefer a Hillary Clinton presidency and could react with panicked selling should Trump defy the polls and deliver a shocking upset on Nov. 8." Ben White, Politico, October 2016. "A President Trump Could Destroy the World Economy", headline of Washington Post editorial, October 2016. The economy under Trump is not being compared to Obama's but it is compared to Ronald Reagan economy. Under Reagan the US also saw a boom the like of which we are seeing now. Obamas economic score card is 11 million jobs under 8 years while Reagan was 28 million under 8 years. Obama was creating 1,357,000 jobs a year. Reagan was creating 3,5000,000 a year. Trumps average is 2,000,000 jobs a year and with a guarantee another 4 years in the Whitehouse he will create 16,000,000 jobs. His goal to create 25,000,000 jobs under under 2 terms. With the way things are going he will reach that goal. MAGA! All because of the Tax cuts and deregulations and of Obama's legacy. Nonsense! ..Obama inherited a recession, turned it around and trump inherited a already grown economy..Period! These Micronesian-never trumpers have the same level of Trump derangement syndrome like their kins in the mainland USA. God bless them and heal these sick folks from their illnesses. Liberals: He will destroy the economy. 2018: Best unemployment rate and GDP in 80 yeard. @reaper, the 8M job lost you mentioned was the beginning of the recession in 2008 President elected Obama inherited from Bush administration. look it up, cause you are making up history.everything you say in your post are not the true. @ PS, that debt will be paid off in no time if Trump follows the lead, anyways, He had to stimulate the economy by injecting what he called the stimulate package into the economy thed end result,is what being bragging about in here..
Wrong! Obama added 9 trillions under 8 years and lost millions aka 8 million jobs. His friends in Walstreet got rich and now obama is getting paid by those bankers to appear in their parties. Failed president getting rich off bankers. Team putin and your mama. MAGA.